We moved into our house on Halloween day, 2002. It’s located in “downeast” Maine about a mile and a half from the sea shore. It was built in the 1880s and at one time it was a pretty famous for chicken canning. One of the sons of the former owners was KIA in WWII. We have love letters he wrote his 3-month bride before he was killed right before the end of the war, 1945. The older gentleman who lived in the house prior to the people we bought it from actually died in the house and it was a few days before anyone found him. But it appears a young girl is haunting the place and we don’t know who she is or why. I have seen her, and my father has seen her. The property also seems to be haunted because you walk by the windows and I don’t know how many times we’ve seen someone out in the fields around the house, walking towards the old goat pens, only to double back to look and see no one. The person in the field is wearing a white shirt and black suspenders. Here’s some of the weird things we’ve encountered: We were doing renovations, having the roof replaced and having a dormer put in the upstairs bathroom. One day when the workers were not there my father and I were the only people in the house. I was upstairs in my bedroom and my Dad was downstairs in the library, directly below my room. (There is a staircase that runs down the wall outside my door). He was sitting in his chair opposite the door and saw a girl come down the stairs, turn away from him and go into the dining room. He thought it was me so he called out to me, but I was upstairs and hadn’t moved. About 20 minutes later it happened again. We got up and searched, but no one was around except us. The night I saw her I was laying in bed looking out the window when I felt someone standing over me. I looked to the side without moving and saw her face hovering over my bed. It was oval shaped and in sharp contrast, all whites and blacks. All I could see was her face. She was looking down at me with no expression, and then she just suddenly wasn’t there anymore. I wasn’t afraid, I’m surprised to say, I just felt like she was looking in on me. On Christmas Eve one year I walked into the dining room to find 2 dead earthworms on the dining room floor. I have no idea where they came from. Needless to say in December in Maine the ground outside is frozen. There was no dirt on them either, they were just laid out like a present. We have a full basement as well so there is no way they came up out of the ground and through the floor boards. I called my folks in to see and it was a curious moment, but we threw them away and went on with whatever. An hour later I came back through and there were two more worms laid out in the exact same spot! We checked and the other two were still in the trash. Nothing more after that but it was still weird. While we’re working away my older sister who lives next door watches the property for us. There is a small figurine of Uncle Sam that came from a Red Rose tea box that sits on the kitchen windowsill. Several times my sister has come over after no one has been there for weeks to find that figurine moved to the kitchen table, more than 5 feet away, or to the kitchen counter which is even farther. My nieces were cleaning the house for us, knocking down cobwebs and generally keeping the dust down, but refused to do so after they heard someone crying upstairs in the empty house. General haunting also abounds. 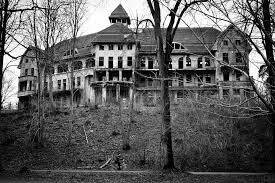 You will hear footsteps in parts of the house where people are not about, you will hear and feel doors open and close, change in the air pressure is readily apparent, only to check and find nothing moved. Drawers in a certain bureau containing board games will open regularly. You hear it opening and then go look and they are opened, pulled all the way out. At night there is always a feeling of being followed around the downstairs of the house, but never on the second floor. And there are certain rooms in the house that always feel occupied, or that someone is outside staring through the curtains at you, even if the window is closed and the curtains pulled shut. I’m sure there is more but this is all I can recall at the moment. We were contacted by the Dead Files TV show about possibly investigating our house, but the producers decided no one was scared to live there so it wasn’t exciting enough for TV. I almost completely forgot about the Victorian Gentleman I saw. It was late at night, around 1 a.m. My sister and I were cleaning the house from top to bottom in preparation of my parents coming home for the holidays. (I think it was Thanksgiving. My Dad works nuclear outages so they are away a lot). Anyhow, I was standing in the kitchen facing my sister who was in the dining room door way. We were chatting about what had been done versus what needed to be done, when behind her, I saw the upper shoulder and lapel of a man’s suit walk into the jelly cupboard, a converted door that once lead to the basement. I can’t imagine the look of shock on my face because my sister immediately asked what was behind her. I told her, and we checked, but of course there was no one there, and there wouldn’t be, it’s a solid wood door that leads to a six inch deep pantry. He was all gray and tall, all I could see was the shoulder of a suit jacket and a lapel, but the cut reminded me very much of a frock coat.